Welcome to my new website. The intention of this new design is to give a more comprehensive and intuitive appraisal of the last 70+ years of my paintings and works on paper, many of which have not been seen before. That said, the works displayed on the site still only represent a selection of my work. This website will be evolving over time, so please check back to it periodically for more insights, news and enhanced functionality. 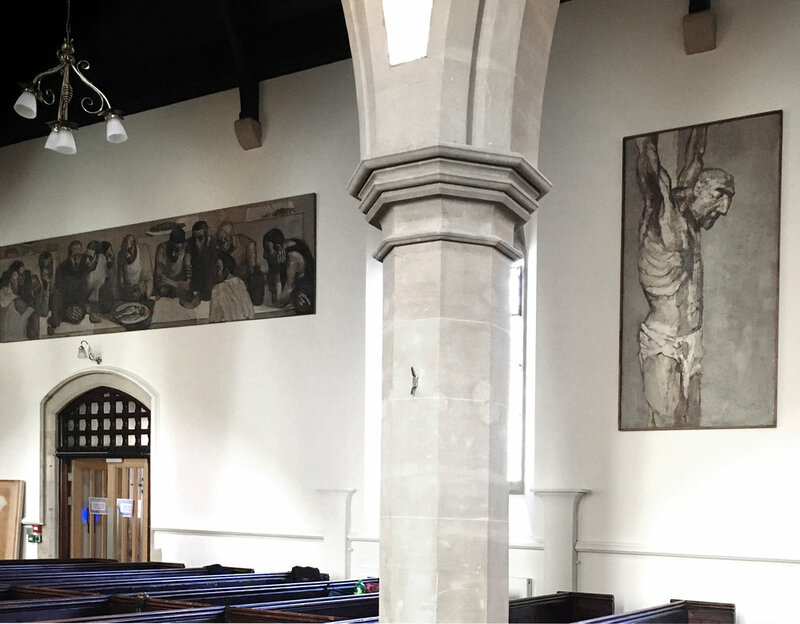 Two landmark works from the 1950s, The Last Supper (1959) and The Crucifixion (1956), have been rehung in the recently refurbished Christ Church, Kensington. They complement a large contemporary painting currently on display at Tate Britain entitled Corrida (1955-6). Whishaw has lived and worked in his Kensington studio since the 1950s, a few moments away from Christ Church. The Last Supper is one of Whishaw’s most significant early works in which he brings a seriousness and emotional weight to ordinary people and everyday situations. The Crucifixion focuses on the intense personal suffering and loneliness without showing Christ’s entire body, the Cross or surrounding people. Whishaw’s paintings vary dramatically in size, the smallest work in this exhibition, his playful ‘Spider’s Website’ measures 15 x 10 cm whilst his ‘Forest Interior Triptych’, hanging in the next door barn is 168 x 685 cm. To allow him to work on these very different scales Whishaw divides his time between two studios in Bethnal Green and Kensington. The exhibition continues upstairs with a group of works by Whishaw’s late wife, sculptor Jean Gibson (1927-1991) and sculptor Nicole Farhi, who was taught by Jean Gibson in the Kensington studio where Whishaw still works today. This large painting dating from 1955–6 depicts a crowd at a Spanish bullfight. Realised in muted tones of brown and ochre oil paint on canvas, the long, landscape-format composition is divided horizontally along the centre by a rail that separates the dense crowd of spectators from the startled white horse running from right to left across the foreground. The horse is cropped so that only the upper part of its body and outstretched head and neck are shown. The title, Corrida, is the Spanish term for bullfight, a shortened form of corrida de toros, literally ‘running of the bulls’. During the first stage of a bullfight, ‘picadors’ – horsemen with lances – jab at the bull. The loose, fleeing horse here may suggest that the picador has been unseated during this part of the event.